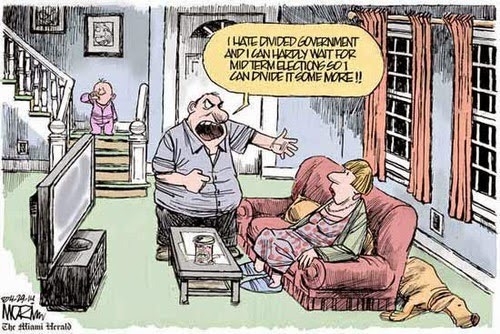 The Dividist Papers: Barack buys an election? No, I don't really believe that Barack can buy the election. Obama's base of political and financial support is genuine. We don't know who all his contributors are, but they are genuine in their support. The amount of money that Obama raises is a function of his celebrity, his success as a candidate (big money special interest and corporate contributors genuinely love a winner), and his campaign's very effective and extremely aggressive pursuit of filthy lucre without regard for source or size. Still, I can't help but wonder what happened to the Democrats and Liberals who used to call for public financing of elections, claiming that the Republican fund raising machine was the equivalent to "buying an election". I guess it is perfectly ok to "buy an election" as long as it is a Democrat doing the buying. Frankly, I don't have a problem with how much money the Obama campaign raises. I consider the money that individuals, special interests and fat cats voluntarily contribute to Obama to be an expression of free speech. I oppose the public financing of campaigns. I have never checked off the box on my tax form to contribute my tax dollars to a political campaign fund. I opposed the McCain/Feingold Campaign "Reform" as a restriction on free speech. As far as I am concerned, if you want to take out a sub-prime second mortgage on your house and send Obama the proceeds, hey - both Obama and McCain will bail you out - go for it! However, I do think there should be 100% perfect transparency on the source of every nickel contributed to every candidate. The Obama campaign apparently does not agree, as evidenced by their deliberate and calculated use of an on-line contribution mechanism which, unlike McCain's (or every single retailer who accepts on-line credit card purchases) , makes it easy to hide the identity of small contributors. "Sen. Barack Obama's presidential campaign is allowing donors to use largely untraceable prepaid credit cards that could potentially be used to evade limits on how much an individual is legally allowed to give or to mask a contributor's identity, campaign officials confirmed. Faced with a huge influx of donations over the Internet, the campaign has also chosen not to use basic security measures to prevent potentially illegal or anonymous contributions from flowing into its accounts, aides acknowledged." Ed Morrissey learns from experts in credit card verification, that this was not just a matter of forgetting to turn on the credit card verification option "Team Obama probably didn’t just opt out of using these verification processes, but more likely rewrote the code on their site to bypass them..." Curiouser and curiouser. Putting aside for the moment the propriety and rationale for the intentional sloppiness in the Obama on-line contribution security - the efficacy of the Axelrod/Obama contribution machine, the enormity of their war chest, and the unprecedented spending it permits has produced some truly astonishing effects and consequences that are, in and of themselves, worthy of note. Most interesting - the Obama campaign is responsible for the end of public financing of presidential campaigns. The irony here is just too rich. Barack Obama, the candidate of a party that has long championed public financing, reneges on a commitment to public financing when it becomes clear he can raise far more money privately. By making a cynical, smart, self-serving decision to abandon the public financing system, he wins the presidency. John McCain, the candidate of a party that has long fought against public financing or, for that matter, any limitations on campaign contributions, accepts public financing as a matter of personal conviction, is severely disadvantaged in the campaign, and loses the election. Lesson learned: If you accept public financing - you lose. Public financing of a major party presidential campaign will never happen again. The Obama campaign killed it for all time. Good. "MR. BROKAW: That fact is that Obama did go back on his word about accepting public financing. He went to private sector. He is spending a ton of money. Is this the end of public financing in American politics, Chuck? MR. TODD: $3/4 billion dollars is what he is going to raise. MR. TODD: Yeah. About equal for what McDonald's is." Think about that. The Axelrod/Obama campaign has spent as much selling the Barack Obama brand as McDonald's spends selling hamburgers. The numbers boggle the imagination. According to MSNBC, in the first 15 days of October, Obama spent over $105M or about half of what McCain spent on his entire Presidential campaign to date. Obama is spending $293,000/hour to win the Presidency. Gigot: And part of the problem, John, is McCain is lacking the money to be able run all the messages, some positive spots--Obama's running some positive spots too--but to answer some of those negative spots, for example, that claim that he would pay for some of his programs by cutting Medicare by $800 billion. I don't really agree with that, and I think that's a rebuttable proposition but if you don't have the money to do it, you can't rebut it. Fund: Obama is fighting on a dozen fronts. McCain, because of the lack of money and resources, has to respond two or three of those fronts. The rest basically has to go by the boards. It is no wonder that McCain must reduce spending in some states to compete in others. The wonder is that the polls are as close as they are with Obama outspending McCain at these extraordinary ratios. There are reports that in some markets Obama has purchased all available advertising, so McCain could not increase their spots even if they had the money. No. Really. Don't look here, look over there. And in the midst of all of this, what is both the traditional and new media focused on? They are focused the McCain campaign spending on Sarah Palin's wardrobe and makeup. Even if you take the reported $150,000 wardrobe number at face value, you are talking about 30 minutes of Obama campaign spending or one half of what I like to call an "Obamahour$". In light of the Obama spending the coverage is, as Palin said "Ridiculous... Those clothes, they are not my property. Just like the lighting and the staging and everything else that the RNC purchased, I'm not taking them with me." "Under those circumstances, the extra $5.3 million for the vanity platform at Invesco seems like a strange and very frivolous spending choice. Obama could have given the same (uninspiring) speech at the Pepsi Center and saved millions of dollars. This isn’t the same as buying a wardrobe for a candidate who lacked one; Democrats had already spent almost $15 million on the Pepsi Center. Obama had a perfectly good stage on which to accept his nomination and demanded another for his own ego." "Lost in the attention given to Obama's Internet surge is that only a quarter of the $600 million he has raised has come from donors who made contributions of $200 or less, according to a review of his FEC reports. That is actually slightly less, as a percentage, than President Bush raised in small donations during his 2004 race, although Obama has pulled from a far larger number of donors. In 2004, the Bush campaign claimed more than 2 million donors, while the Obama campaign claims to have collected its total from more than 3.1 million individuals." It is certainly true that the Axelrod/Obama campaign machine has broken all records for the absolute number of small donors. The more important point, is that to an even greater degree they broke all records for absolute numbers of rich, super-rich, special interest, corporate and fat cat donors. That is the real meat and potatoes of the Axelrod/Obama campaign war chest. In my previous post (x-posted at Donklephant) commenter BenG suggested that I was swimming in "a bottomless pool of cynicism" regarding both parties. I guess that is fair. I just do not think it is a good idea to give Obama and the Democrats the virtual monarchical power that is in the offing next week. But that is just me. Others apparently think the Democrats and Obama will not be corrupted by more more special interest money and more concentrated power than has been granted any U.S. leader in more than a generation. 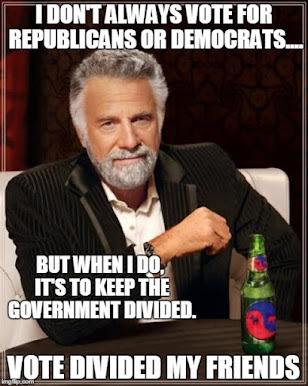 Connections between special interests, corporate interests, lobbyists, their contributions, and the access and influence the contributions garner must be inferred from circumstance. It has to be circumstantial, because if it was explicit it would be considered bribery and a felony. The only thing that can possibly keep these impulses in check is complete transparency on contributions and an opposition party with a share of power. The Republicans are about to be rendered impotent, and transparency is not a high priority in the Axelrod/Obama campaign. So - we are back to too much power and too much secrecy. This should work out well. I guess I prefer swimming in a pool of cynicism to sitting in a hot-tub of hypocrisy, and I am seeing a lot of hypocrisy in the Obama campaign. Since one party rule under Obama is a foregone conclusion, perhaps we should a better understanding of the the presidency we are buying and take a peek under the Axelrod/Obama secrecy kimono. Lets start with a good hard look at the deep and broad connections between just one major corporation and the Obama campaign. I'll list some of the connections. You can infer your own conclusions from the circumstances. Broderick Johnson is a lobbyist for AT&T. He is the president of Bryan Cave a lobbying firm that receives large amounts of money from AT&T to represent their interests in Washington. Broderick Johnson contributes large amounts of money to Obama and other Democratic party candidates and causes. Broderick Johnson is also an adviser to the Obama campaign. Lyndon Boozer is a lobbyist for AT&T. He receives large amounts of money from AT&T to represent their interests in Washington. Lyndon Boozer contributes and arranges contributions of large amounts of money to Obama and Democratic candidates. Lyndon Boozer is a good golfer and loves to play golf with Democratic politicians. AT&T was a major sponsor and contributor to the Democratic Party convention in Denver. In return, AT&T got their logo printed on a very nice leather tote bag. I'm sure that promotion on the tote bag was all that AT&T wanted in return for sponsoring the convention. AT&T threw a lavish party for Democratic politicians at the Democratic convention in Denver. In the interest of supporting the Axelrod/Obama policy of zero transparency, the press was not invited. Not even the very liberal Democratic bloggers and reporters. Some reporters were even roughed up to keep them out. Nothing to see here. Move along. "Mr. Axelrod’s consulting business is divided between two companies. One, AKP&D Message and Media, focuses on political campaigns and is where Mr. Axelrod devotes most of his time. He is on leave from the other firm, ASK Public Strategies, which consults for companies and nonprofits, and is run primarily by his partner, Eric Sedler." "Among ASK's other clients: AT&T. The telecom company, formerly known as SBC Communications, had been a customer, Sedler confirms, when it requested ASK's help to defeat a broadband referendum..."
"Prior to joining ASK Public Strategies, Sedler served as a Public Relations Director for AT&T Corporation, managing the company’s offices in Chicago, Atlanta and Miami. In that position, he was responsible for directing the company’s corporate public affairs campaigns in the central and southeastern United States." So AT&T gives a lot of money to ASK. Some of that money is in David Axelrod’s pocket, as one of three partners in ASK. But David Axelrod is on “leave” from ASK. Nothing to see here. Move along. I am sure that all these AT&T connections are coincidental. 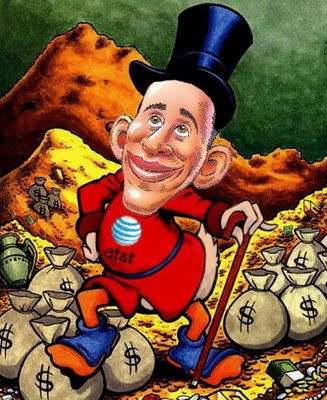 I am sure that all of this circumstantial generosity has nothing to do with the fact that AT&T was under the cloud of a civil and criminal lawsuits as a result of their cooperating with an illegal Bush administration request to spy on Americans. I am sure that this has nothing to do with the fact that Barack Obama said he was opposed to granting AT&T immunity, but voted to grant AT&T immunity with the FISA capitulation. Pure circumstantial coincidence no doubt. Draw your own conclusion. My conclusion - Obama will say anything when it is just talk and does not matter. He will act another way when it counts. That is the pattern we saw with Obama and Public Financing. That is the pattern we saw with Obama and Telecom Immunity. He talks reform, but acts out of self-interest. He talks bi-partisanship, but voted with a perfectly partisan 97% toe-the-party-line Democratic party voting record. That is the Obama/Axelrod way. That is the Chicago way. And that is truly Change that AT&T can believe in. Obama may not buy the election. But AT&T may very well have bought a president. And you can fool some of the people all of the time. UPDATED: 10-28-08 - Fixed links and typos. UPDATED: 10-29-08 - Added WaPo & Politico articles. x-posted at Donklelphant - some good discussions in the comments there - check it out. "In my previous post (x-posted at Donklephant) commenter BenG suggested that I was swimming in "a bottomless pool of cynicism" regarding both parties." I am inclined to disagree with BenG. I think you just have a more realistic idea of human nature than he does. After all if power corrupts and absolute power corrupts absolutely then isn't putting one party in control of everything essentially setting them to fail their electorate? "If men were angels, no government would be necessary. If angels were to govern men, neither external nor internal controls on government would be necessary. In framing a government which is to be administered by men over men, the great difficulty lies in this: you must first enable the government to control the governed; and in the next place oblige it to control itself." I just find it astonishing the degree to which Obama supporters believe him to be "an angel" and willing to trust him with so much power with so few checks. It is s athe triumph of hope over reason. did you see the att product placement on the infomercial? @RAC - No... Actually I did not watch it, guess I 'll have to watch it now. An ATT product placement? Really? That takes some chutzpah. Or unbelievable arrogance, or greed, or stupidity. Federal Appeals Court Rules Chelsea Manning Must Testify Or Remain In Jail - A Federal Appeals Court has rejected Chelsea Manning's bid to be released from jail notwithstanding her refusal to comply with a Grand Jury Subpoena.